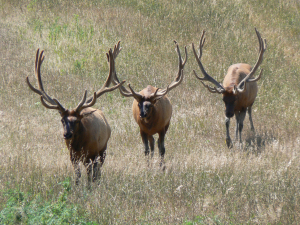 The state of Colorado is one of the best states in the western mid-west for hunting elk and deer. Both mule deer and whitetail deer are abundant, with healthy elk herds found throughout the state. If you are planning hunt, or just need more information on how to apply for tags, where to hunt, the different habitat types the state offers etc, you have come to the right place! Colorado offers fully guided hunts via a variety of licensed and experienced outfitters, as well as DIY hunts for hunters looking to do it solo. Most hunters find the best results by going with a guide or outfitter during the first one or two hunts in order to learn about how a particular species is hunted. Remember, the open country of Colorado is much different then the open fields of Kansas or dense woodlots of Wisconsin where hunting from tree-stands or over small food plots for whitetail may be the norm. Most big game hunts here require lots of moving around to locate the animals, and lots of time spent tracking the animals in order to get close enough for a shot. And finally, the hike back to camp with hundreds of pounds of elk, moose or deer meat on ones back can be a real jolt at high altitudes. The learning curve can be quite large, and as a result the best way to go if you are new to this type of hunting is to bite the bullet and hire a guide, leanr how to hunt the right way, and then take the ball and run with it once you are confident you have the experience to do so. The good news for big game hunters is that the September 2014 wildlife and Parks committee meeting members gave the stamp of approval to the deer and elk hunting season program from 2015 through 2019. It was impressive group effort including mail-in surveys telephone surveys, town hall discussions, public focus meetings as well as commentary from hunters who are residents as well as nonresidents. Many conservation and hunting committees and a great number of concerned residents pitched in to help construct the upcoming big-game hunting seasons framework. In an effort to increase the number of younger hunters in the state, more youth hunting licenses are going to be available in upcoming seasons. Nearly 15% of total licenses for antelope mule deer in Whitetail deer as well as elk will be set aside for youth hunting seasons age 12 through 17. In addition to this any youth hunters who have not yet filled and antlerless permits can use that permit to hunt any other antlerless season in an attempt to fill that tag. Another change concerns mountain lion hunting. While the early season lion hunt will remain relatively unchanged in intact, a new season in the fall has been established. This will allow hunters hunting elk and deer to also take advantage of harvesting mountain lions. The black bear season will see an early archery opportunity opening early September and closing at the end of the month. In addition to that in early black bear rifle season runs September 2 through the 30th. For deer, elk, antelope and moose, the structure is more or less the same as it was in 2014. There is an earlier muzzleloading season opening September 21 which runs for nine days. With this exception, not much else has changed. Many hunters have been asking if any changes are going to be made to the existing preference point system which creates a waiting list or priority system allowing hunters to draw on limited tags available for hunting certain species. The way it is currently set up, hunters who have gathered more of these preference points are given an advantage when the particular permits they have enlisted for are being drawn. While the system is far from perfect, and there have been complaints regarding its overall fairness, it was decided to keep the system relatively untouched as it has been working well overall in the management of these big game species. Overall, hunters have shown an increase in the level of overall satisfaction with how the deer, elk, bear, and other big game animals seasons have been set up over the past few years. Because of comments from hunters and concerned citizens the antelope season was changed with hopes of providing more hunting opportunities. And as was mentioned earlier, youth hunting opportunities have been expanded in an effort to attract more youngsters into the sport of hunting. Hunting licenses may be purchased online, over the phone, or at any Colorado Parks and wildlife approved licensing agent. Remember, that proof of Hunter education is required for any hunting license purchased. If you did not receive a big-game license via a draw, there is still a chance to procure one via the left over big-game limited license program. This allows tags left unclaimed to be distributed to other hunters. First come first serve licenses are also available for a variety of big game species. Some of these have caps on the number of animals which can be taken during a season. Others are sold on an unlimited basis but may be restricted to only certain hunting units and types of hunting such as rifle, archery only, muzzleloader, etc. Hunting licenses may be purchased with any major credit card such as Discover, American Express, Visa, and MasterCard. When purchasing a license on the phone or online, most will be sent out immediately and should arrive within seven days. Please note that it’s important to write down the temporary authorization number after purchasing a hunting license. This number is important because it allows hunters to hunt without having the actual license on them after the license has been purchased. This allows for a 14 day grace period from the time you purchased a license to when it actually arrives in the mail, at which time the Hunter much must keep it on his person at all times. It’s also important to always sign your license in order for to be valid. Not signing your license can lead to issues with validity and maybe even a fine. There are also new restrictions for moose hunters in certain game management areas. After a mishap last year were a bow hunter arrowed a bull moose within view of a crowd of onlookers, there was an uproar of concern. While the Hunter’s actions were legal, and he was licensed to be bow hunting moose in that particular area, the resulting public outcry was enough to warrant a change in the regulations in order to prevent this from happening again. It’s only a small restriction affecting the area near Brainerd Lake, so most big-game hunters will not have to worry about this they are hunting different areas. Overall the outlook for big-game hunting is promising for 2015, with an increase in elk numbers, and deer herds rebounding in many areas. 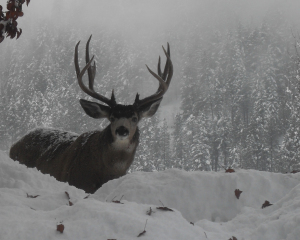 On the Western slope, numbers of mature Whitetail, and mule deer box have increased as well as numbers of elk bulls. Recent mild winters have helped elk production by sustaining the herd, and lowering the number of bulls killed. Hopefully we’ll get some wet weather to provide for better tracking in stalking conditions. The dry, drought conditions can lead to noisy grass and leaves, making quiet walking difficult if not impossible. The heat can also affect the movement of these big-game animals. Dear for example will stay hunkered down until after dark when the heat dissipates, and elk will tend to be at higher elevations and in thick timbered areas where it is cooler with better cover. If drought conditions persist, be sure to scout water sources as they can be prime areas for these big-game animals. Crossbow hunting is also allowed now but be sure to check the regulations for permitting info. In a nutshell, poor hunting conditions over the last two seasons, has produced some excellent herds of both elk and deer for this season. Depending on the weather, hunters could see some very high success rates, and some very large box in bulls roaming around out in the wild. Remember: Always hunt safely, know what is behind your target and always heed blaze orange clothing requirements. Many areas now require blaze orange clothing when hunting deer, elk, and other big game animals while rifle hunting public or private hunting land. When looking for a place to hunt or inquiring about hunting land that is for sale or lease, always consult the regional hunting maps to ensure the particular piece of land is in an actual open area for whatever species you intend to hunt.